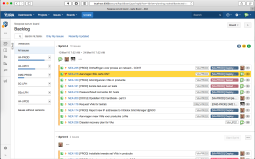 It's no secret that I'm a staunch lover of Atlassian's Jira, a project and workload management tool for DevOps (or agile) teams. I was introduced to Jira at my previous client and I've introduced it myself at $CURRENTCLIENT. The ease with which we can outline all of our work and divide it among the team is wonderful and despite not actually using "scrum", we still reap plenty of benefits! Unfortunately I couldn't get an official Jira project setup on $CUSTOMER's servers, so instead I opted for a local install on my Macbook. Sure, it foregoes a lot of the teamwork benefits that Jira offers, but at least it's something. Besides, this way I can use Jira for two of my other projects as well! Getting Jira up and running with a standalone installation on my Mac took a bit of fiddling. Even Atlassian's own instructions were far from bullet proof. Download the OS X installer for Jira. It comes as a .tgz. Extract the installer wherever you'd like; I even kept it in ~/Downloads for the time being. Make a separate folder for Jira's contents, like ~/Documents/Jira. Ensure that you have Java 8 installed on your Mac. Get it from Oracle's website. You should now be able to startup Jira, from the Terminal, by running the "start-jira.sh" script. The best thing is that Jira handles the sleep mode a laptop just fine (at least it does so on OS X), so you can safely forget about your Terminal session and close it. I've had Jira run for days on end, with many sleeps and resumes each day! Upgrading Jira should be as easy as downloading the latest archive (step 1) and then repeating steps 5 and 6 on the files from the new installation. All Jira data lives outside of the installation path, thanks to step 3. EDIT: If you ever need to move your Jira data directory elsewhere (or rename it), then you'll need to re-adjust the setting of JIRA_HOME in the shell scripts. You will also need to change the database path in dbconfig.xml (which lives inside your Jira data directory).